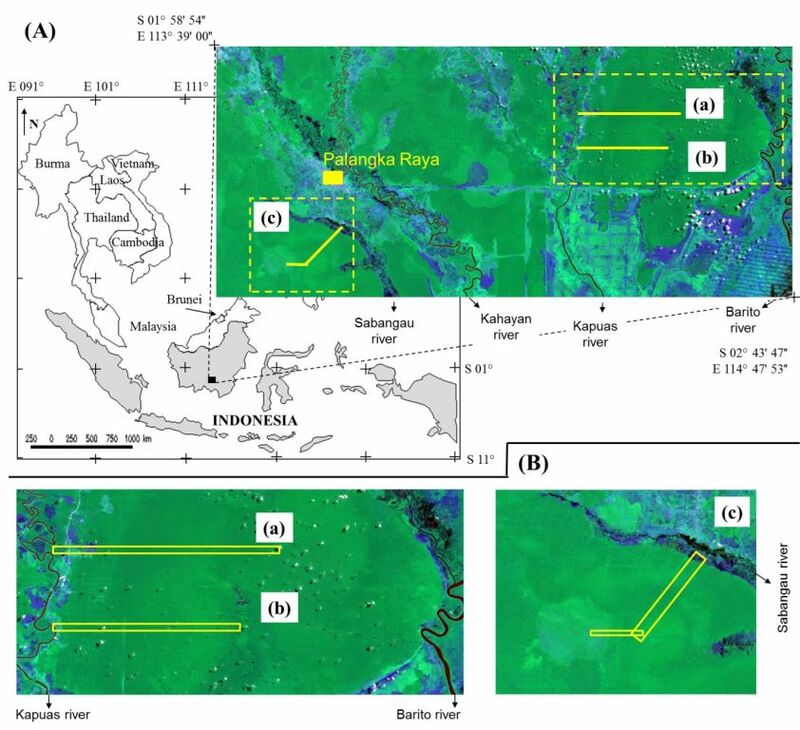 Figure: Location of the study area in Central Kalimantan, Indonesia (top) and location of the three selected test sites (bellow). The yellow rectangle shows the location of the Palangaka Raya city. The solid yellow lines indicate the LiDAR transects (A). Lower part of the image indicates in order: Mawas km228 south of Equator (A), Mawas km238 (B) and Sabangau (C). Each test site is indicated in more detail over the Landsat-7/ETM+ acquired on August 5, 2007 (3R4G5B). Southeast Asian tropical peat swamp forests (PSF) are important for their large carbon stock storage and rich biodiversity. Reports suggested that PSF display specific surface patterns linked to hydrology which reflects on biodiversity, vegetation structure and carbon dynamics. On the other hand, excessive peat subsidence has been recorded in both degraded PSF areas and excessive drained peatlands. Therefore, the key importance of PSF to ecological processes, their resilience for forest degradation and logging highlights the need for a comprehensive forest monitoring in which LiDAR technology may play an important task. Three small-footprint LiDAR transects were acquired in July 2007 and 2011 using the Riegl LMS-Q560 system. Each transect encompasses an ecological peat dome gradient ranging from the river system to the peat dome. The three transects faced in the past different forest degradation intensities. 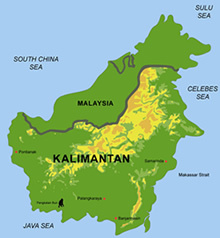 The transects are located at the Sabangau National Forest (one site) and the Mawas Reserve (two sites) in Central Kalimantan, Indonesia. Our main objectives were to map changes in the vertical structure of the PSF (canopy height), to relate different height metrics, and Above Ground Biomass (AGB), and from these maps to identify both sources and sinks of carbon across the three-peat dome-shaped gradients. AGB values were related to in-situeld measurements. The spatial patterns of biomass changes matched expected patterns given the distribution of PSF physiognomies and previous forest disturbance history. Pairwise comparisons showed that the canopy top height changes are coincident with expected changes based on the different PSF physiognomies. Undisturbed PSF showed similar canopy heights between the period of 2007 and 2011, while degraded PSF had net gain in average of up 2m. As a result, the AGB map (derived at 1ha sample plots) showed most of the PSF as a carbon sink, with widely scattered and isolated areas as neutral (no net biomass change) and sinks caused by both dieback effects and current logging activities.The quantification of the AGB changes and the sensitivity of LiDAR to characterize the vertical structure of the PSF may help further development under the Reducing Emissions from Deforestation and Degradation (REDD+) mechanism.Keywords: Peat Swamp Forest, Peat Dome Slope, self-regulation mechanism, LiDAR, airborne laser scanning, change detection, REDD, Kalimantan and EMRP.